It’s Not Just You. We Had the Third Hottest June Ever. Warming is now at levels not seen for 115,000 years. Last month was the third-hottest June on record globally, temperature data suggest, confirming 2017 will almost certainly make a hat-trick of annual climate records, with 2015, 2016 and 2017 being the three hottest years since records began. The figures also cement estimations that warming is now at levels not seen for 115,000 years, and leave some experts with little hope for limiting warming to 1.5C or even 2C. 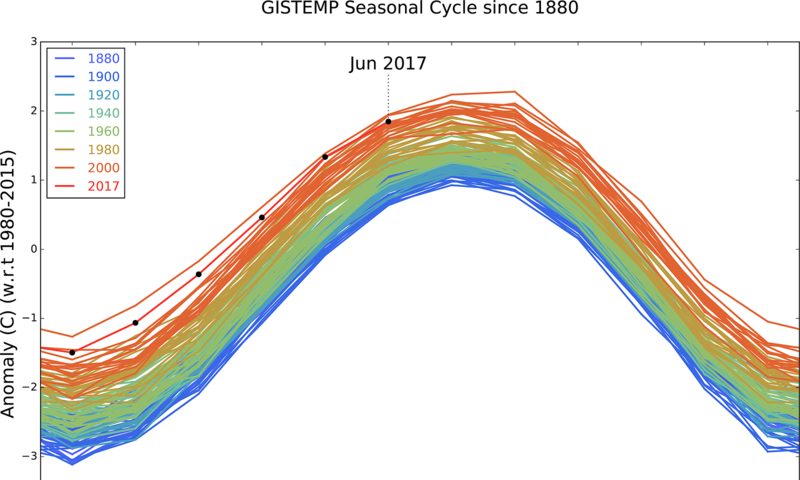 Monthly temperature anomalies compared with the 1980-2015 mean, according to NASA’s GISTEMP data set from 1880 until June 2017. According to new figures from the US National Oceanic and Atmospheric Administration (NOAA), June 2017 was the third-hottest June on record, beaten only by the two preceding Junes in 2015 and 2016. The NOAA data show combined land and sea-surface temperatures for June 2017 were 0.82C above the 20th century average, making a string of 41 consecutive Junes above that average. June 2016 still holds the record at 0.92C above the 20th century average, followed by June 2015 which was 0.89C above the baseline. The data line up closely with NASA figures released last week, which are calculated slightly differently, finding the month was the fourth-hottest on record – with June 1998 also being warmer in their data set. Based on the NASA data, climate scientist and director of Nasa’s Goddard Institute for Space Studies Gavin Schmidt estimated that 2017 was probably going to be the second-warmest year on record after 2016, but would almost certainly be among the top three hottest years. The June data see all of the first six months of 2017 sitting among the three warmest months on record, making it the second-hottest first half of a year on record—again, beaten only by the previous year. The near-record temperatures continued this year despite the passing of El Niño, which normally warms the globe, and its opposite—La Niña—currently suppressing temperatures. The warming trend is almost certainly caused by greenhouse gas emissions—mostly the result of burning fossil fuels—with many studies showing such warm years would be almost impossible without that effect. Last year, Michael Mann from Pennsylvania State University published a paper showing the then-record temperatures in 2014 would have had less than a one in a million chance of occurring naturally. Andy Pitman from the University of New South Wales in Sydney, Australia said the onslaught of very rapid warming in the past few years is likely a result of the climate system “catching up” after a period of relative slow warming caused by natural variability—the so-called “hiatus”. But Pitman said the ongoing trend was “entirely inconsistent” with the target of keeping warming at just 1.5C above pre-industrial temperatures. Current trends suggest the 1.5C barrier would be breached in the 2040s, with some studies suggesting it might happen much sooner.